The Internal Revenue Service (IRS) is changing the website to file the Form 990-N. The Form 990-N used to be hosted by the Urban Institute, but starting February 29, 2016, the IRS will host the Form 990-N submission website. The Form 990-N is a short, annual filing that small (those normally with annual gross receipts up to $50,000) tax-exempt organizations file in place of the lengthier Form 990-EZ or Form 990. 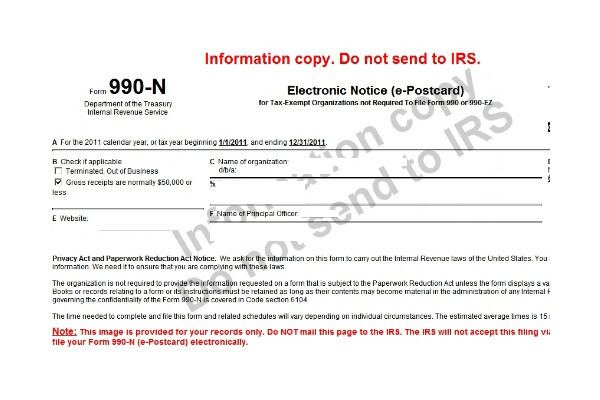 In order to file the Form 990-N, all nonprofits will be required to complete a one-time registration and file Form 990-N submissions through the IRS’s website at www.IRS.gov/990N. Can our homeschool nonprofit get a new EIN to start filing the Form 990-N?